Thorough understanding of these principles will ensure avoidance of all confusion, doubts and abstruseness regarding the spiritual path. 1. The demands of the religion should be given preference over worldly benefits. 2. The intellect should always remain subservient to the Divine Law (Shariah). 3. Do not to be negligent in volitional (ikhteyari) actions (that is, within one’s determination and control). 4. 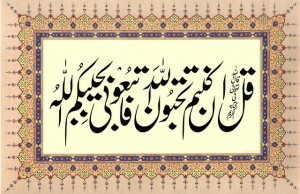 Do not be in pursuit of things that are beyond one’s control (ghair-ikhteyari). 5. The seeker must abandon all his mental planning and delegate (tafwidh) all this to Allah. 6. Keep focused on the goals of Shariah and not to be distracted by things their opposite. 7. Consider spiritual states (kayfiyat-e-batiniyah) to be a good thing to happen but not to regard them as the primary goal and objective (of the sulook). 8. Do not to be overwhelmed by emotional factors and desires. Act judicious as per the verdict of intellect. Keep the intellect subservient to Shariah at all times.